The Cast and Crew for Gina K Designs welcomes you to another fabulous blog hop celebrating the new Home for the Holidays StampTV Kit and a number of gorgeous stamp sets by our illustrator team! We hope to inspire you with some beautiful card projects as you hop along to each of the designer’s blogs! 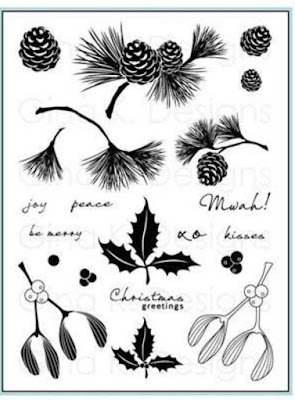 Today I have a clean and simple card that I made with Claire Brennan's set, Festive Foliage. 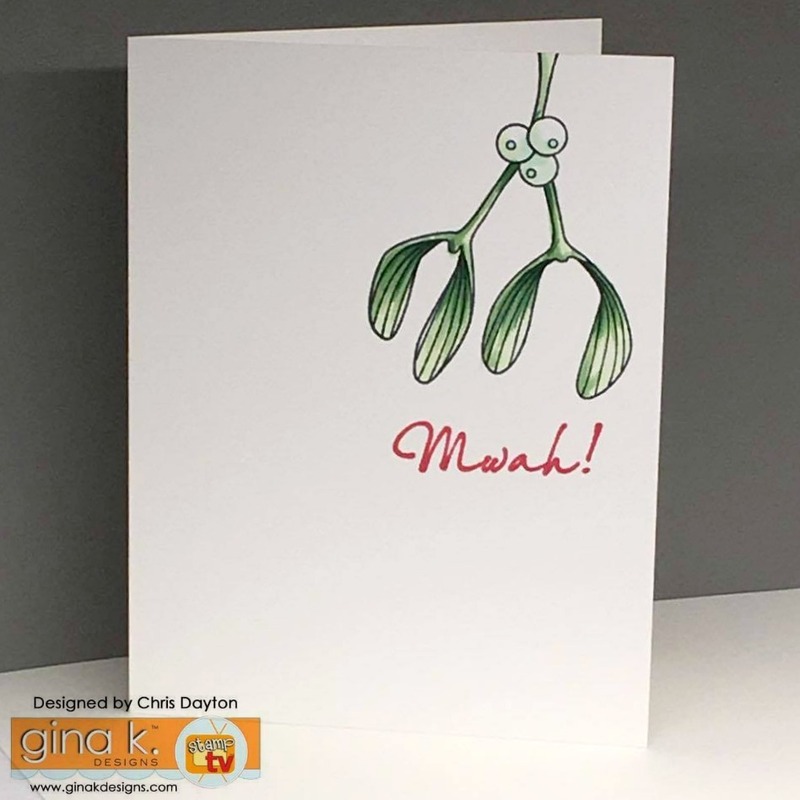 This is just a very simple design using the mistletoe image stamped in Memento and quickly colored with Copic Markers. I love all the white space, and the Red Velvet sentiment really shines. 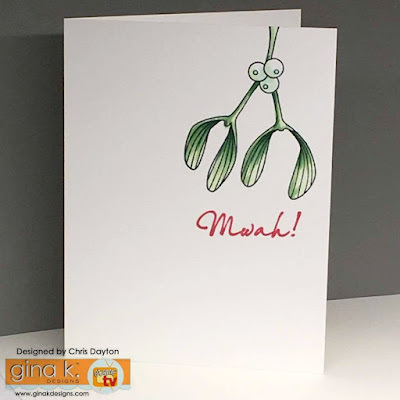 Perhaps I had mistletoe on the brain, because my next card uses the mistletoe sentiment from Beth Silaika's Ian Moose stamp set along with the cute little moose. I stamped this adorable little Moose and sentiment on a square of 90# watercolor paper with Versafine ink and colored him with Zig Clean Color Realbrush markers. The pretty patterned papers are from the Home for the Holidays Stamp TV kit, and are trimmed and accented with Jelly Bean green, Turquoise Sea and White card stock. Chris Dayton - You are here! Love your designs, Chris! You have such a great style! Love your coloring on Ian and that mistletoe is one great CAS design! Super cute cards. I agree with Melanie, Ian is adorable. 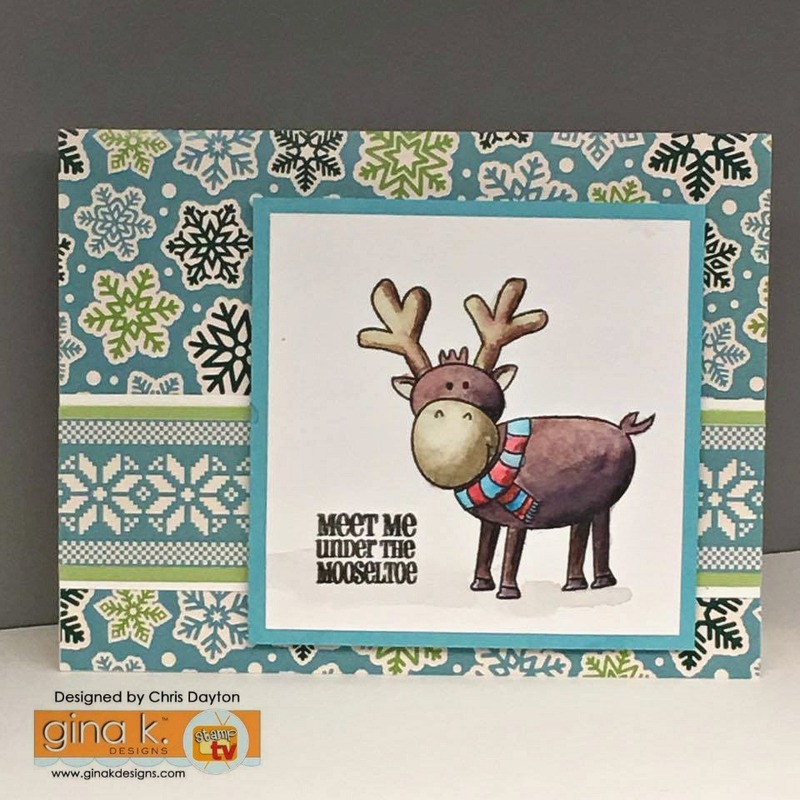 That moose is the cutest, and I love the back ground you created with the patterned paper. Pretty cards! Your coloring is spot on. Such great color combining style. Great cards. Love the moose. I love the quick and easy look of the mistletoe. Very pretty cards, and so glad you shared them with us! Mistletoe Mwah and a moose! What's not to love?! Awesome Chris! Awesome coloring on Ian too! 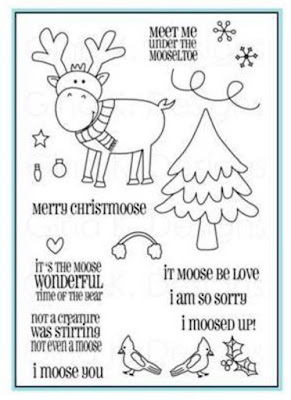 Loved your color choices on the moose card. Cute cards! Love the moose. Love the CAS design on the first one and your coloring on Ian is perfect! Your Ian card is adorable and of course I love the cas, thanks!! Love your CAS card, great design. 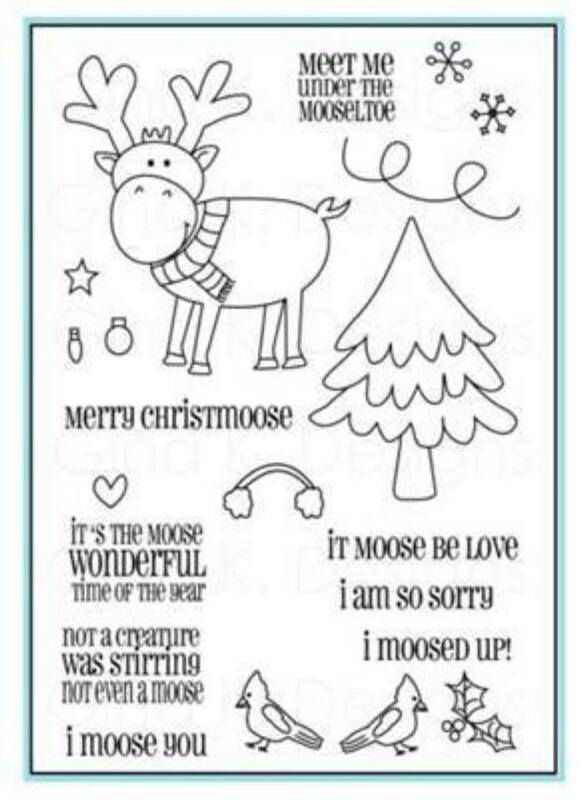 Your moose card is also very pretty with the pattern paper. It makes Ian stand out. Thanks for the inspiration. Wonderful cards, Chris! Love your coloring on Ian and the fabulous CAS designs! Beautiful cards, Chris. Thanks for sharing! Beautiful cards you created. And, you are off to a great start on Gina's design team. Congratulations once again! I just love your "Mwah" card! This is probably the cutest CAS card I've seen! Love it! So cute, that moose is so adorable and love how you colored him! very pretty! love the background you did on the moose card! Thanks, Rose! I used the patterned paper from the StampTV kit. Great cards. Of course, my favorite is Ian Moose. Thanks for sharing. WOnderful cards! Thanks for the inspiration! Lovely cards. Ian Moose is so cute and everyone has used him in so many different ways. So cute. Ian Moose is so cute and versatile. Super Adorable but that first CAS card is absolutely PERFECT! I have that set on the way so I feel a case coming on! Thanks for the inspiration Chris! Love the CAS card and the cute moose card! That moose lol LOVE him! That Moose.....so cute. And that wonky tree...love,love..
Sweet cards, and that moose is just so dang cute!! Really adore Ian moose! Great cards. Aww! Sweet! Ian is so cute and your card is really fun! Your Ian Moose card is super cute!! Oh...I got a good giggle out of the mistletoe card! Love it. Great designs, both simple and sweet! Wow, great cards Chris, my fav is Ian!